Mammals aims to present separate accounts of the means by which each of the major groups of animals regulates its body temperature, heat production, and heat loss. 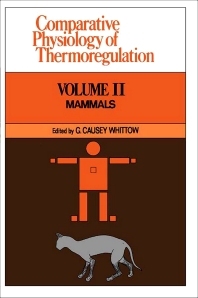 Readers who wish to obtain information on thermoregulatory processes in different species will welcome this as a convenient reference work. It is hoped that the treatise will have more than convenience value. This volume comprises five chapters, with the first focusing on rodents. It discusses the thermal environment of rodents, thermal behavior, and precision of homeothermy. Chapter 2 focuses on carnivores and discusses general thermal defenses, protection against hypothermia and hyperthermia, and cold acclimation. Chapter 3 deals with body temperature, behavioral thermoregulation, and food and water intake of ungulates. Chapter 4 focuses on primates and discusses normal thermoregulation in the monkey, fever and other responses to pyrogens, and neurochemical control mechanisms in the hypothalamus. Finally, Chapter 5 discusses man's energy exchanges related to temperature and work, behavioral versus physiological temperature regulation, and a mathematical model of man's thermoregulatory system. This book will be of interest to practitioners in the fields of physiology, epidemiology, biology, neuropsychology, and public health.